Posted January 25th, 2017 by Stephanie Zubiri & filed under Furthermore. 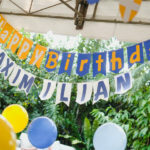 Some time mid-last year, I was sitting in my pajamas, working in front of the computer, when I received a call from Tita Irene Francisco. 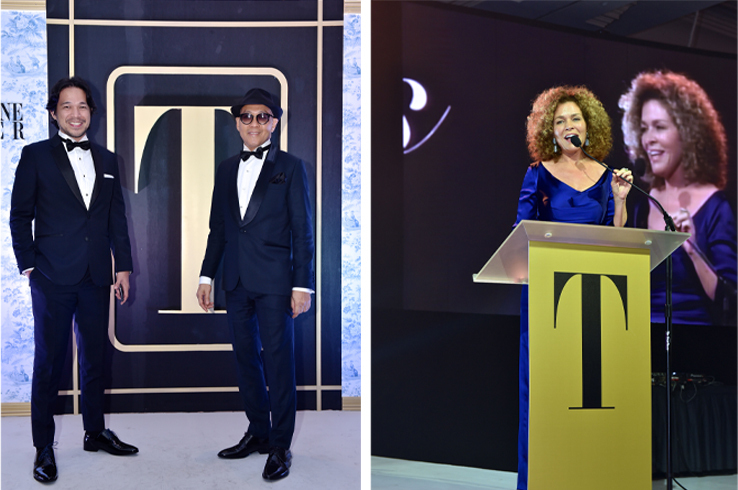 She announced to me that they had chosen me as Philippine Tatler’s Asia’s Most Stylish for their 15th anniversary. I was floored. All the ladies who have come before me are women I have admired not just for their impeccable style but for who they were and what they stood for. 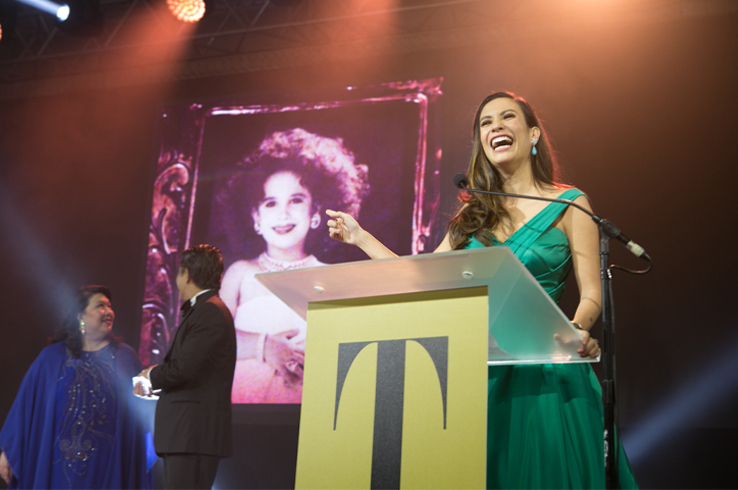 Fely Atienza and my best friend Stephanie Kienle-Gonzalez are prime examples. It was such an honor. One that I truly did not expect. I am by no means a fashionista. I’ve given up on major fashion magazines a long time ago because many times they always made me feel inadequate or pushed me to buy things I didn’t really need. The only real fashion magazine I truly look forward to is Porter because of their in-depth articles on strong and empowering women. Otherwise, in the fashion department, I have things in my closet that I love and date all the way back to highschool. I’m happy to re-use a dress or a favorite top over and over again if it works. I’ve also started having formal separates done as opposed to the usual gown and dress, so that I can easily mix and match when the need arises. I love supporting local designers and recycling long forgotten old dresses. Why they chose me as Asia’s Most Stylish is beyond me but one thing’s for sure, it was a title I would take to heart and above an incredible opportunity I wasn’t going to waste. You see, above all, awardees get a few minutes at the annual Tatler Ball to address the crowd, more than the title and that to me was golden. That was the true honor I was grateful for. When else was I ever going to have that opportunity to address such a prestige group of movers and shakers. businessmen, diplomats, philantropists… It was frightening for sure, but a precious moment I did not want to squander on platitudes. That moment was also the first time my father would see me speak in public. More than anything, I admire my parents so much, it meant a lot to me to have them there and to be able to honor them. The ball was amazing as always. Meaningful, fun and above all managed to raise over 10 million pesos for patients at PGH who were in the later stages of breast cancer. What a spectacular way to commemorate their 15th anniversary. 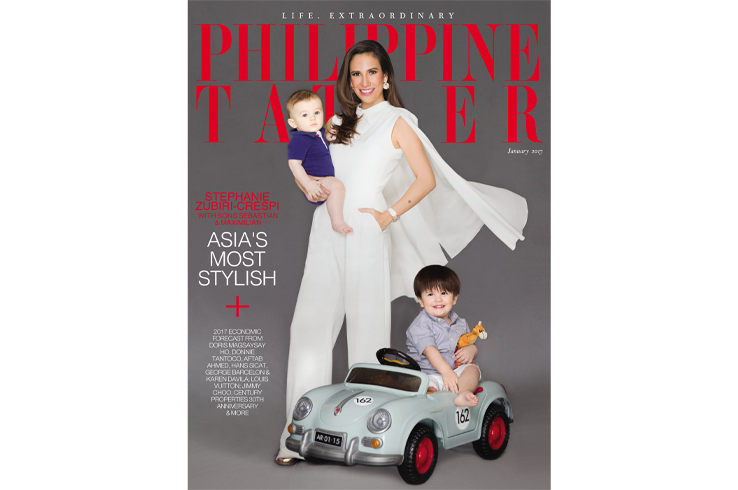 Thank you so much to everyone from Philippine Tatler for this opportunity! Tita Irene and Anton for always being so supportive. So happy that Anton and I were able to get to know each other even more after he spent a few days with me in Venice for the Asia’s Most Stylish shoot with the other ladies from around the region (read more about that trip here). We also did a fun shoot here in Manila which is in the current January 2017 issue of Philippine Tatler. Thank you to the whole team behind the local shoot – MJ Jose for the article, Monique Madsen for styling, to my forever love Al de Leon for makeup, Eddie Mar Cabiltes for hair. And of course to Raymund Isaac who was the very first ever photographer I worked with as a teenager for my first ever professional campaign. Another special thank you to EIC Anton San Diego! Thank you to everyone for this incredible opportunity and for including my cutie pie boys in the shoot! I am finally putting this out there in the public. Just in time for the February 2017 Ball Issue. 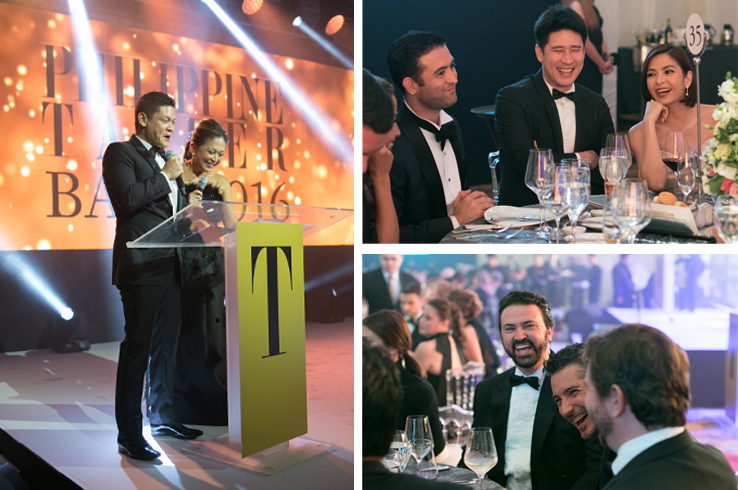 Here is the speech I gave at the 15th Philippine Tatler Ball as well as some amazing photos from the event. This speech meant a lot to me, thank you guys for taking the time to read it. “When I first got the call from Tita Irene, I was so honored! Then I looked down at myself and at home working on articles, with ratty pajamas, messy hair and slippers and I thought to myself – are they sure? Why me? Then it dawned on me – oh! Because once upon a time I was a mini Vicky Zubiri! Joking aside, I can not accept this award without a nod to my parents, both style icons in their own right and of an immense influence to me especially as a child. My mother is always so glamorous and put together that even as she was being wheeled into brain surgery she asked the nurse to apply lipstick on her during the operation. When I was small she would dress me in mini versions of her own clothes. I mean who knew that dynasty level shoulder pads weren’t appropriate for a 6 year old? My father was known as being one of the most stylish politicians in history, arriving in congress in his signature blue jeans, blazer and cowboy boots. He always gave me sound advice like matching your belt to your shoes. Once I came to school in that catholic school girl uniform but with black socks. I was sent straight to the principal for demerits and I simply argued – my father said that we shouldn’t wear white socks with black shoes or else we’d look like Michael Jackson. However it’s not what they wore that made them stylish people but how they lived their lives. My mother has shown incredible strength and despite all her surgeries and ailments manages to radiate her iconic joie de vivre and share her positive and beautiful energy with everyone. She makes this world as effervescent as her favorite beverage. My father has spent his life giving back to the community, helping people whether through his incredible work as a politician or his generosity as a father and grandfather. What does it really mean to be stylish? For me it’s someone who takes the time for other people. To send a thank you note after a nice dinner, to help out a stranger by giving them your seat or holding out the door for them, the people who choose to listen and give … That’s when you say – hey! That person has style! It’s easy to discredit clothing as being something superficial but in fact it can play a key role in our relationships. I remember arriving in Paris, Fresh off the boat, excited to meet up with one of my only French friends there. I got dressed up like any 18 year old would in the early 2000’s. Jeans, high heels and this mesh top that was well probably more suitable to a walk down Pigalle rather than aperitif in Saint germain. People were dressed in their black and grey sweaters with converse sneakers with that chic French I don’t care je ne sais quoi. And well. I looked inappropriate. It was then I realized that rather than wanting to stand out, I wanted to assimilate myself and be assimilated. They say you can’t really know a man until you walk a mile in their shoes. That’s exactly what I hoped to do, swap my heels for sneakers in order to immerse myself in the culture so that I could learn and in turn share more. Clothing is a powerful tool and what you wear conveys a message. The burkini, the pantsuit, clothing or at times the lack thereof – it’s not a merely a form of coverage but a statement. It can act as a wall or break down barriers. It is even more true now amplified by the power of the internet and social media, where people have their own stage and grandstand. With the recent hot politics in the local and global scene rather than being a platform to connect people social media has often brought us apart. These are very divisive times and if we want to change this we need to seek to comprehend and look beyond ourselves. It’s not about that perfect selfie. It’s about throwing away the camera. It’s about living in that moment so we can truly connect with one another. It’s not necessarily about standing out or standing alone but about opening up. To run a marathon in another person’s shoes. To build bridges and weave communities. so that we can be respectful, tolerant and compassionate. You are all builders of bridges and weavers of communities, people who have made an impact and can shape the future of our beloved Philippines…. 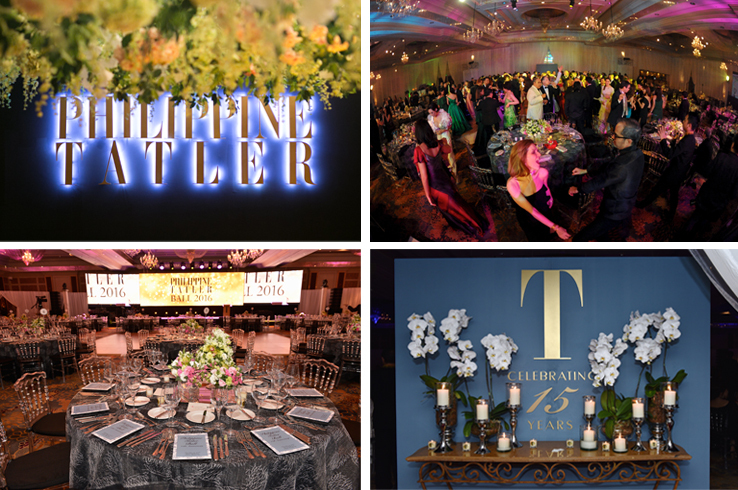 As always, Tatler Ball is always so beautiful, classy, never over-the-top and always a good mix of the heartfelt and fun-filled moments. 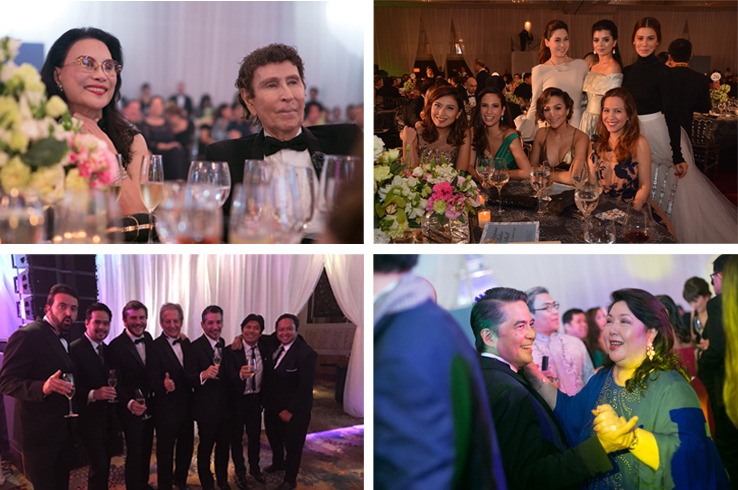 Congratulations to raising over 10 million pesos to help breast cancer patients at the Philippine General Hospital! 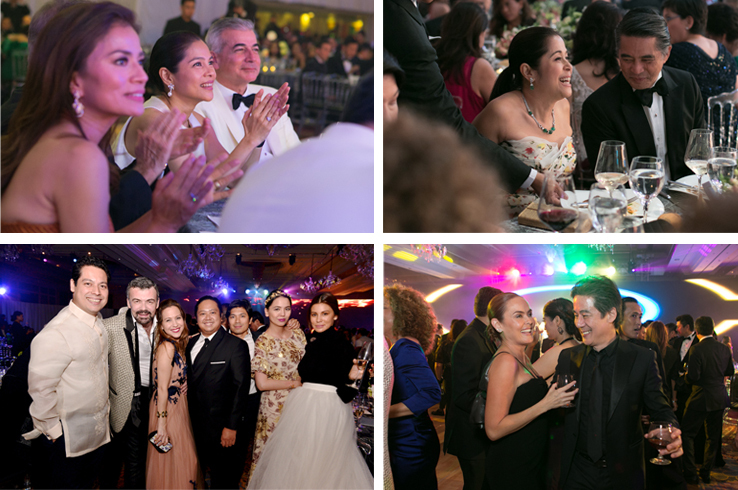 Other awardees that evening were Royal Pineda and Budji Layug for excellence in design and the incredible Deeds Zobel for her philanthropic endeavors. Such an honor to be in amazing company that evening. Philippine Tatler’s EIC and dear friend Anton San Diego with journalist and host extraordinaire Karen Davila. Thank you to both of them for their support and kind words during my introduction. Karen is another woman who I truly admire along with Rissa Mananquil Trillo in the top right photo. What she has done with cosmetic company Happy Skin is beyond amazing. Seated next to her is her husband Paolo Trillo and good friend Marco Lobregat. Sharing a laugh with my hubby are some of my favorite men, Antonio Ressano and Christian Gonzalez. Here are some wonderful people who I truly admire. Tito Rico Tantoco and son Donnie. I love the Tantoco family and their work ethic and good family values. Between Rustans and SSI and all their subsidiary brands, they prove that the good guys can succeed. Three generations of hard work and kindness to their employees, suppliers and partners. I love when you walk into Rustans or even their supermarkets, there are people who have worked there for years. 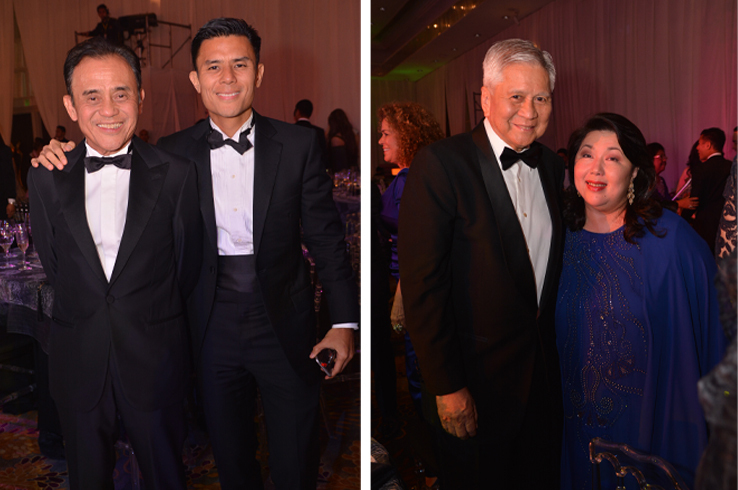 Former DFA Secretary, Ambassador Albert del Rosario was given the lifetime achievement award that evening. His dedication to his job and how he championed the plight of OFWs abroad is truly admirable. He truly is one of the most exemplary filipinos.Beside him is Tita Irene Francisco, publisher of Philippine Tatler, Tatler Homes and Tatler Traveller. When I first started out as a young lifestyle writer, she was always so kind to me at dinners and events. I am so grateful for her years of support. It so nice to see her with her husband Dr. Randy Francisco and her daughter Isabel. They are such a lovely family and work so well together. My ever so beautiful mother with Tito Maurice Arcache – who is my ninong by the way! 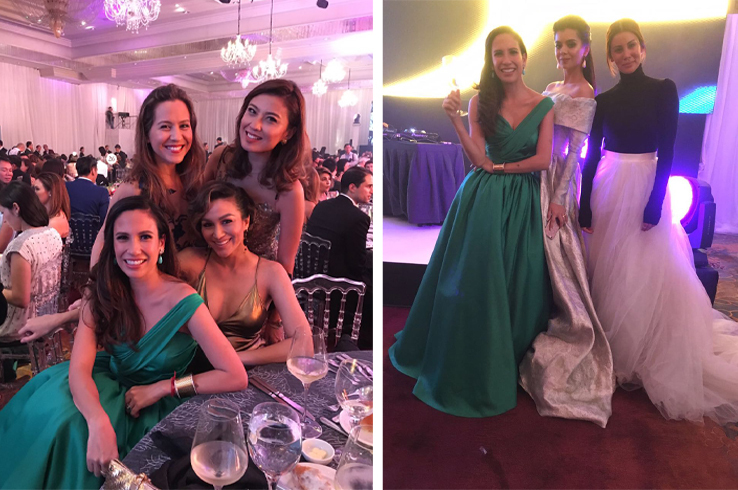 These gorgeous ladies I love so dear: Cristalle Belo-Pitt, Rocio Olbes-Ressano, Tricia Centenera, Rosanna Ocampo-Rodriguez, Stephanie Kienle-Gonzalez and Jackie Antonio. The handsome and dapper men – I love how they all clean up so nicely for the ball! Antonio Ressano, Marco Rodriguez, my husband Jonathan, Tito Max Kienle, Christian Gonzalez, Marco Antonio and my super dear friend, super chef and birthday twin Aaron Isip.Tito Randy and Tita Irene having a moment on the dance floor. Some of the wonderful people at the ball. 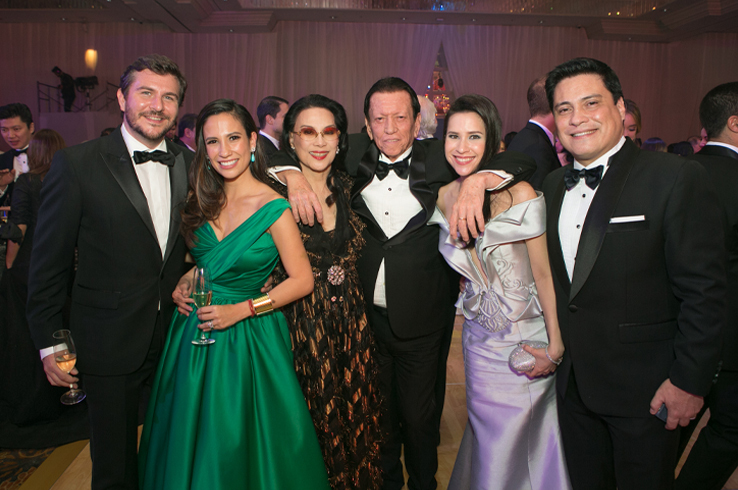 Tita Zelda Kienle, Kit and Fernando Zobel, Tita Chuchu Madrigal, Jon-jon Rufino, Xavier Beth, Jackie, Aaron, Marco, Ingrid Chua and Tricia. Lastly I love this couple – the always chic Joanna Preysle-Francisco and her hubby and partner-in-chic Raul Francisco. I love how they work so well together as a couple, business partners and art collectors. Love these ladies so much they needed more photos! Everyone looked spectacular at the ball. I love seeing everyone’s dresses. 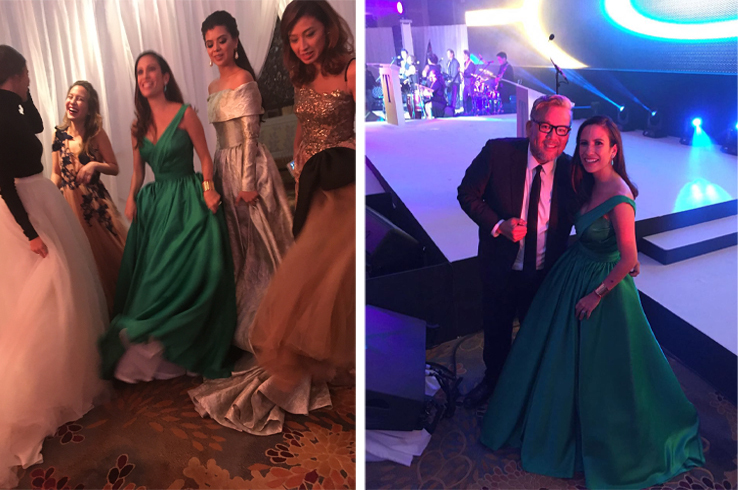 Speaking of gowns and dresses, I have to give a big, big thank you to my love Rajo Laurel. That evening, he made me feel like a princess. 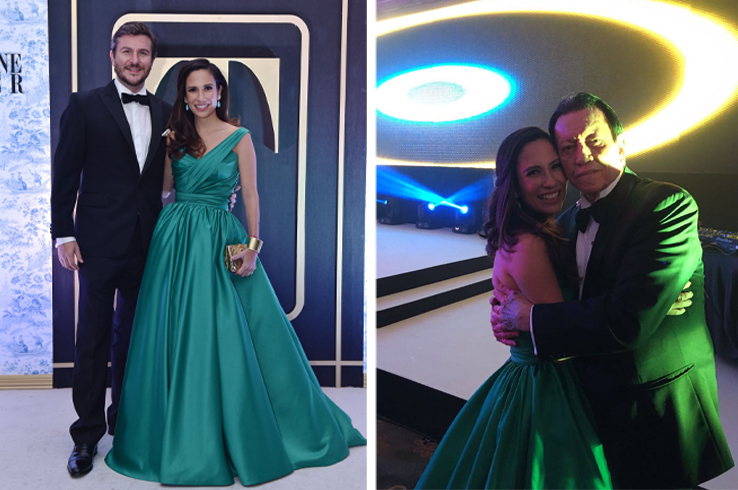 It’s the most beautiful dress I have ever worn.It felt like a sea of liquid columbian emeralds… Thank you so much for always working your magic on me! This is also a dress in two pieces! I get to wear the skirt and the top again! And last but definitely not the least, the two men in my life. My husband and my father. I love them both so much. They are incredible men and incredible fathers.